Hundreds of bicycles are stolen in the City of Salisbury each year. Thieves are motivated by financial gain and the use of bikes for transportation. This type of theft can occur anywhere in the city. Places with high concentrations of parked bicycles such as college campuses are especially vulnerable to theft. Offenders will pick, cut, pry, or saw through locks or steal removable parts. If you can increase the time and effort it takes to steal your bike with locks and other security measures, it will reduce the likelihood that your property will be targeted. When police officers are not provided with the serial number or other identifying information, they may not be able to link a recovered bike to its rightful owner. Additionally, this is an under reported crime so there may be no record of the theft when a bike is found. As a result many of the bicycles are unaccounted for in the police property room. • Choose sturdy locks such as a U-lock or very heavy-gauge chain. Talk to a store employee or do some research about a device’s safety rating. Many cable locks are easily cut and should not be used as primary security. • Secure your bicycle to a strong and immovable rack or fixture. Make sure that your bike can’t be lifted from it. Be wary of locking your bike to the end of a rack where the bolts can be removed to access your bike. • Lock your tires to the frame and rack. • Take all removable parts including the seat with you or lock them up. • Consider using more than one type of lock, which will require more time, effort and tools to steal your property. • Don’t leave a lot of slack between your lock and the fixture as this gives a thief more room to access your lock with his or her tools. • Even if you are parking in a secured garage of an apartment complex, lock your bike to a rack or store it in your unit. The helmet, tire, and frame are all locked up. • Don’t leave your property unlocked and unattended even if it is for a short time. Many bikes are stolen from open garages, unlocked basements, sides of homes and apartment or condominium hallways when owners leave them for a few minutes. • If you store your bike in a garage or shed, make sure that the doors and windows are secured with sturdy locks and security hardware. • Keep bicycles out of view from garage and other windows that are easily seen by passersby. • Park your bike in a well-lit and visible location where there is a lot of pedestrian traffic or a video surveillance camera. • Consider investing in a GPS tracking device that isn’t easily identified or removed from your bike. • Don’t leave a bike that is locked to a car rack unattended for long, and bring it in with you at night. • Proactively register your bike and include its serial number and photos with the bike registration services located in the link below through the Salisbury Police Department. If it is stolen, the serial number and photos will be handy when you file a police report. This will improve your chances of recovery if your bike is found and may help the police link a criminal to the theft. • If you don’t register, maintain the serial number and photos on file. • If there is no serial number, etch or mark an identifier on the crank shaft or other bike part and keep record of it. Some people use a driver’s license or state id number that the police can easily look up. Whatever you choose, don’t etch personal information that can be used for identify theft such as your social security number. • Use caution when purchasing a bicycle that is listed on Craigslist and other websites at a price well below market value. It may be stolen, and you don’t want to unwittingly contribute to the crime. Check the serial number of the bike on national stolen bike registries before you purchase the item. Serial numbers that have been painted over or tampered with may also indicate a theft. 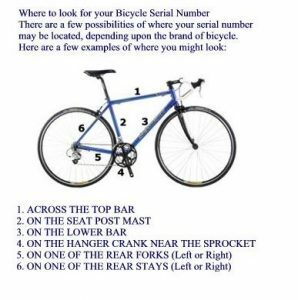 • If you know your serial number and want to find out if your bike is at the Property / Evidence Division, call 410-548-3165. • Report all suspicious activity in Salisbury to the police. Your call may stop a crime or could bring a criminal to justice. Call 911 for emergencies.